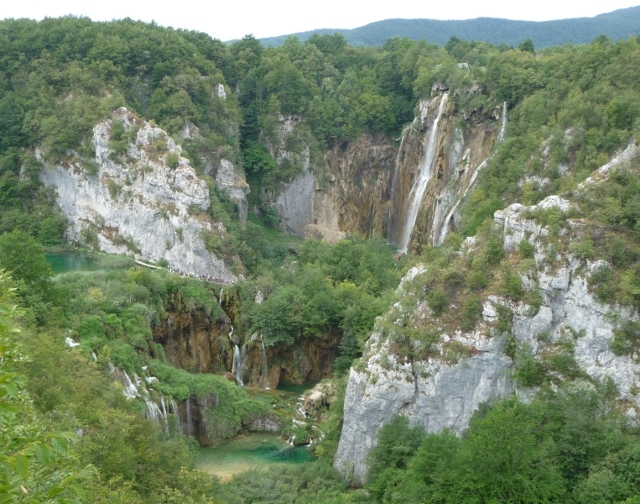 Back in Croatia and time to see one of the country’s major must-see sights – Plitvice National Park. On the way from the border crossing to Plitvice we passed through Slunj, where the Korana and Slunjčica rivers meet and the river flows on through a gorge with a series of small waterfalls. A pretty riverside watermilling settlement of Rastoke close by was a lovely stop for a stroll to view the torrents. Then it was on to find a campsite for the night and we opted for Camping Korana, run by the National Park, which offered a free bus service to the park itself. A larger site than those we normally opt for and quite busy, pitching was free form through undulating land with trees and grass. It felt a bit like a 2cv World Meeting, no Citroëns but quite a few VW T25s and tents dotted in dips and under trees. We found a shady place and settled in for the night. The bus left at 9am, an earlier start than we’ve been used to of late. The weather forecast was iffy with a chance of rain, and it was overcast as we headed for the bus next morning, which was soon crammed with people. We knew it would be busy – it was a Saturday in July after all. We were dropped above the lakes at entrance one of the park. 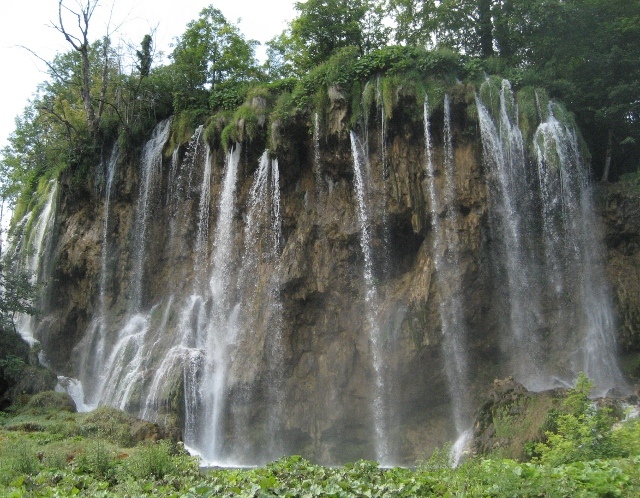 In short, Plitvice is an eight kilometre long series of lakes with waterfalls between them of varying degrees of spectacularness, with cliffs and forest around the edges. Trickles and streams and falls seeping through forests and reeds everywhere you walked. These features were formed by the movement of travertine, deposited by the movement of the water as it makes its way downstream. There are wooden walkways across and around the water, and a boat to take you on a couple of the stretches with a bus back to the entrance (only one go on each of these per ticket). The campsite bus was to collect us at five, and it really did take most of the day to see the whole park. The weather held good, with the sun breaking through providing the perfect day to see the falls. 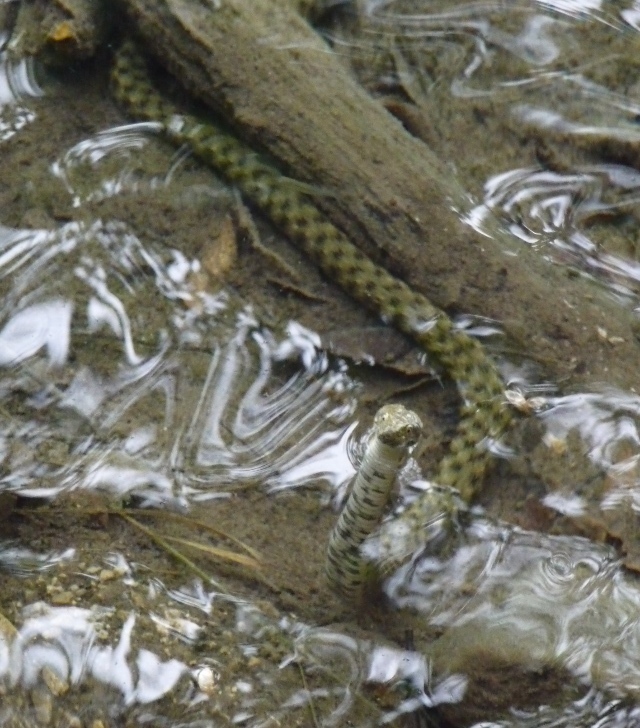 Our highlight was seeing a water snake close to the bank, amongst the teaming fish. 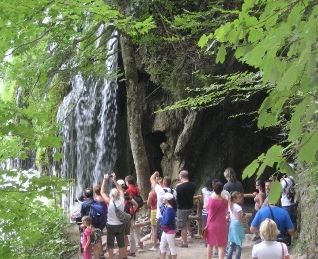 We were disappointed that there was no swimming in the lakes or among the waterfalls as there had been at Krka, but given the volumes of visitors it would have been chaotic, as it was we had to carefully control our frustrations with our fellow visitors. 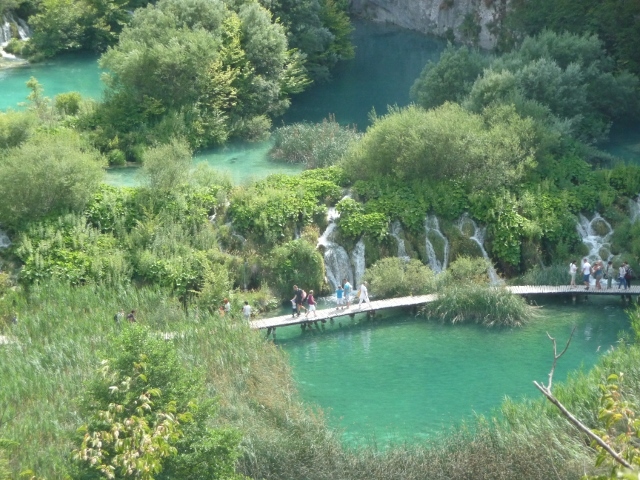 It was a lovely day, but all in all we preferred the smaller Krka National Park, which had a less corporate feel to it and more visible wildlife, with frog calls and an abundance of birdsong and dragonflies. The latter seemed missing at Plitvice, apart from the one snake, lots of fish of the same sort, and some rather ordinary ducks that seemed to get an unwarranted amount of attention. Maybe it was the weather starting to change, or maybe it was because there were too many people, or have we got waterfall fatigue after seeing so many in the last month or so? That night, the weather did take a turn for the worse and it rained heavily for a long time. We can’t complain, we’ve had around six weeks of constant sunshine. The resulting muddiness made the site seem even more like a 2cv meeting. Next morning we packed up early (again) to head to the coast to see our friends again. We had been warned that the weather at the coast was becoming windy and forecast to be more so. 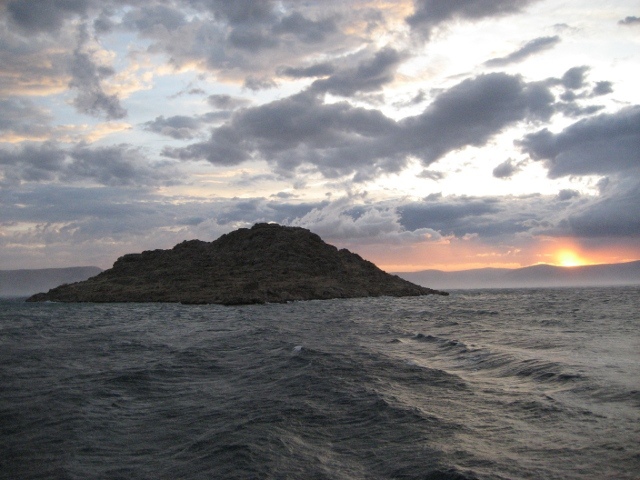 The Bura wind is a fierce wind that blows over the Velebit Mountains seawards, when it is really strong roads can be closed to high-sided vehicles, and island ferries can be stopped. 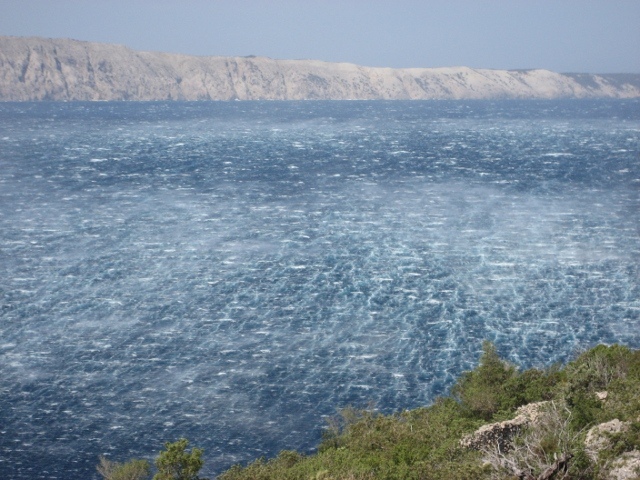 The winds increased as we drove cross-country towards the mountains, and as we wound down through the hairpins back to Senj on the shore, the wind got stronger. My nervousness by being in what to us is a higher than ideal vehicle in windy weather was exacerbated by some insane overtaking manoeuvres by our fellow road users. Romi and Reg getting blown about. We got to our destination without mishap and it was great to see our friends, the Barbour family – Louis, Ana, Reg and Romi, who had been joined by other mutual friends from England – Paul, Philippa and Annie Tyson. Lots of tales shared – they had been on a walk that morning and the wind had blown Paul’s glasses clear off down onto rocks and bushes below the roadway. He had searched in vain for them. It was Philippa’s birthday so that evening we all crammed into Louis’s VW T5 and went to a local restaurant at a little harbour village nearby. Big trays of grilled and deep-fried squid were brought out together with chips and salads and plenty of white wine. The harbour provided its own entertainment as everyone was battling the Bura. A man was trying to get his small motorboat out of the water and onto a trailer. He actually swam out to it, in spite of it being at the harbour’s edge and really rough seas at this stage. Eventually he did succeed, against the odds, in getting the boat out of the water, not after getting his car soaked on the slipway though. Luckily it appeared to be a garage courtesy car. The Bura winds were the strongest and longest lasting for quite some time, and we stayed there longer than intended. 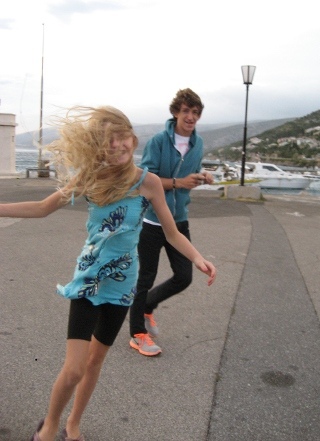 It was such a shame for the Tysons who were only on a week’s holiday in Croatia. Trips in the boat were out, the ferries were running intermittently but with huge queues and the beach was a no-no. The wind was getting on everyone’s nerves as we struggled to walk along in it and spent the evenings sheltering inside with frequent power cuts. We had some great meals though, played rather drunken games and watched films when power permitted, and bided our time. We managed some forays – checking on Louis’s boat moored not faraway in the nick of time as the rope was fraying against the quayside from the motion of the waves. A walk to see a fjord on the coast a bit further south was curtailed, but the sea looked spectacular. So did the queue of the traffic for the Rab island ferry, we estimated around 500 cars were on the road waiting. The news said there was a 15km tailback for the ferry on the island itself (the island isn’t that much longer than this!). On the sea, the Bura had whipped up the white tops and spray flew across the navy blue water creating a dramatic almost frozen wastes appearance on the surface. A drive into the mountains provided a change of scene but no views, the cloud was too low, and it was chilly. 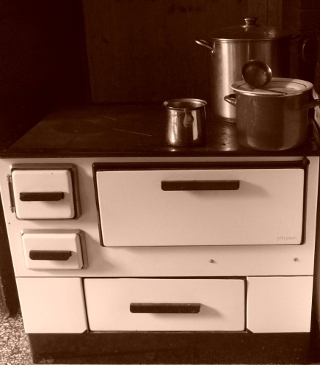 We took refuge in a couple of mountain huts which provided refreshments in an old time atmosphere – tea, coffee and rakija. The rakija was on the house – I think they were impressed that we’d made it up there. Thanks to Philippa for reminding me that we have a sepia setting on our camera (which was actually working for once) and suited the location. We didn’t see any of the bears that are said to roam up there though. Finally the wind started dropping and we were able to take our leave, sad to say goodbye to our friends, but the ferry to Rab – the island we were heading to next, was running and now there were no queues. This entry was posted in By Country - Croatia, Travel stuff, Wildlife stuff. Bookmark the permalink.